Nauru: What do bird poop, the Russian Mafia and Australia’s refugee policy have in common? Nauru was described by The Economist in 2001 as a hotbed of incompetence – as “Paradise Lost…..an enormous moth-eaten fedora: a ghastly grey mound of rock surrounded by a narrow green brim of vegetation“. The one thing that we know is that our [refugee] policies, tough though they are, harsh though they are in many respects, actually do work. They save lives. Crucial to our government’s refugee policy – at least so they would have us believe – is the promise that no asylum seeker who arrives here by boat will be settled in Australia. To achieve this, they have renewed and reinvigorated deals with Nauru and PNG (Manus Island) that were first struck by both the previous Liberal and Labor governments. Rather than considering this to be a hardship, Australia’s political hot potato has been a veritable lottery win for Nauru and PNG. Both have received a substantial increase in foreign aid from Australia as well as a brand new ‘Asylum Seeker processing’ industry to provide jobs and inject hundreds of millions of dollars into their economies. But who exactly are we financing here? We’ve taken money (and jobs) out of the Australian economy so that we can send victims of war, terrorism and persecution to these islands. So surely, with the well-being and lives of asylum seekers at stake and with billions of Australian taxpayer dollars being poured into sending asylum seekers offshore, we would want to ensure that we are comfortable with the regimes we are throwing our considerable financial weight behind. Further, as one of the other regularly promoted goals of the LNP’s refugee policy is to stop the “evil trade” of people smuggling, we would certainly want to ensure that any country we are dealing with is above board, and that we are not directly or indirectly supporting any illegal activities through our investment in their economies. So let’s take a look at Nauru – the Economist’s ‘Paradise Lost’. Nauru is a sovereign state – a single island with around 10,500 inhabitants. It is the second smallest country (population wise) in the world – with only the Vatican City in Rome being smaller. Nauru is only 21 square kilometers – around the size of an average university campus in Sydney or Melbourne. But thanks to mining, around 70% to 80% of the island is now an environmental wasteland – leaving inhabitants with around 5 to 7 square kilometers of inhabitable space. In fact, Nauru is so small, that it doesn’t even have a capital city. Having given up most of its land to mining, Nauru has very little room for agriculture and as a result imports most of its food (much of it from Australia). There are no clean in-ground water supplies, so all clean water is sourced from rainwater or imported. 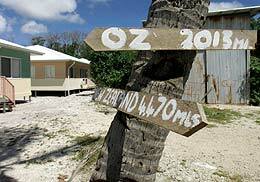 Despite this shortage of arable land and water, Nauru has still found room for a golf-course. In the 1970s and 1980s, thanks to the proceeds of phosphate mining (derived from bird poop) – Nauruans had the highest income per capita in the world. Knowing that the bird poop would run out at some stage, the Nauruan government did set aside income from the phosphate mines for the future. But it also started spending up big time. For example, it set up a national airline of seven aircraft which were often empty and ran at a huge loss. Further, it created ‘jobs’ in the public service for most of the population. At one stage the government employed some 95% of the island’s laborforce. Once the phosphate started to run out, the income started to dry up. The Nauru government also made some poor investment decisions with the money they had saved from the phosphate boom – which meant that by 1993 the Government teetered on the edge of insolvency. The 1.8 billion the government had set aside was somehow all but gone. On an island that small, there weren’t too many money-making options left once the phosphate supplies had dwindled to a trickle and the bulk of the land was left stripped of vegetation. So some bright-spark came up with the idea of allowing foreigners to set up their own offshore bank in Nauru online. When you combine the ability to set up your own bank with laws that provide strict secrecy for any banking transactions done in Nauru – and they had created the perfect environment for money laundering. In 1998 alone, the Russian mafia is said to have laundered $70 billion through Nauru. To further supplement the country’s income, the Nauruan government also set up a passport-dispensing operation whereby it would sell passports to anyone who had the money. This included selling much-coveted diplomatic passports – which confer all sorts of legal immunity to the passport holder. Not surprisingly, it wasn’t long before Nauru’s money-laundering and passport-dispensing boom brought international condemnation. This was soon followed by sanctions – harsher than those against Iraq – which eventually forced Nauru to do something about its latest money-making schemes. During the mining and money laundering booms, the Nauruan government continued ‘redistributing’ much of its wealth through government ‘jobs’. Once the government had limited income from these sources, the jobs dried up, leaving unemployment as high as 90%. While employment has picked up a bit lately, that is primarily due to Nauru hosting our Asylum Seeker Processing centre which generates 600 direct jobs and many ancillary ones. Other than that, the key sources of non-government employment are a few jobs in what remains of the Nauru Phosphate mines and a few in fishing. Nauru finds a new money supply…. Luckily for Nauru, at the same time as they were looking for either a new island or a new source of income, the Liberal government of Australia was looking for a way to solve its politically charged refugee situation. Phillip Ruddock – then Immigration Minister of Australia – was in charge of implementing the LNP’s “Pacific Solution”, and offered Nauru a much needed lifeline: a new industry to bring employment and income to the island nation, along with an agreement to substantially increase Australia’s Foreign Aid to Nauru. Back in 2001, Nauru’s role was simply to play temporary host to asylum seekers while their claims for refuge were being assessed. Once assessed, if asylum seekers were determined to be legitimate refugees they were then moved elsewhere – to Australia, New Zealand and various other countries. It was just prior to the 2013 federal election that then Prime Minister Keven Rudd signed a Memorandum of Understanding with Nauru to extend their role in Australia’s refugee policy to one where they would also allow refugees to settle in Nauru, rather than just staying there temporarily. Two weeks later, when Abbott took the reins of government, he and Scott Morrison endorsed and continued the arrangements that had been made. A key part of our initial agreement with Nauru back in 2001 was to increase the amount of foreign aid we sent there from around $3.5 million per year in 2000 and 2001, to an average of around $27 million per year since then. This equates to around $2700 per Nauruan citizen per year. As a result, Nauru now receives aid at one of the highest rates per capita in the world. And that’s just our foreign aid budget. We also spend an extraordinary amount of money on running the asylum seeker detention centre on Nauru. In the 3 months from July 2015 to September 2015, our government spent 93.26 million dollars to look after 653 asylum seekers on Nauru. This is $143,000 per asylum seeker for the quarter – the equivalent of $572,000 per year. That’s just for operating the asylum seeker centre – meals, water, staff etc. With that sort of price-tag, you’d be forgiven for thinking that asylum seekers are living in five-star beach-side accommodation on Nauru, each with their own private chef and butler. Not so much. The $143,000 fee that we – the Australian tax payer – paid last quarter for every asylum seeker on Nauru covered them sleeping on a stretcher in “mouldy tents full of cockroaches and rodents“. $29 million on monthly visa fees for asylum seekers. Since February 2012, the Australian government has paid Nauru a $1,000 ‘visa fee’ per month for each asylum seeker on the island. $19.5 million for the September 2015 quarter alone for ‘departmental and administrative’ costs (relating to refugees who have been ‘resettled’ on Nauru). $26.5 million redeveloping the Nauru hospital as well as a further $11 million on a clinic. $5 million to a Nauruan government company for providing accommodation to Australian staff. $3 million to another Nauruan government part-owned company (Digicel Nauru) to upgrade its communication infrastructure. The world’s most expensive refugee policy? It’s pretty clear that the government’s refugee policies cost Australians a fortune – over a billion dollars in 2014 for just over 2,000 refugees on both Nauru and Manus Island. By way of contrast, the UNHCR spent $157 million (around 16% of that) over the same period to look after 200,000 refugees, half a million internally displaced people and nearly 1.4 million stateless people. Most recently, New Zealand cut aid to Nauru due to human rights abuses and problems with the Nauruan judicial system (which saw several senior members of the judiciary removed). There have been other accusations of corruption this year. The Nauru government has attempted to silence local dissent – recently shutting down access to social media from the island and suspending members of the opposition from parliament without pay. Question: What do bird poop, the Russian Mafia and Australia’s refugee policy have in common? Answer: Nauru has managed to make money from all of them. If one of the key goals of our Refugee Policy is to reduce criminal activity such as people smuggling in the region, then why on earth did we make a deal with Nauru back in 2001? There was no doubt at all at that stage that Nauru was facilitating money laundering and selling passports to foreign nationals – including to Al Qaeda. And even if we made a mistake back then, why do we continue to prop up their regime today when there are so many stories around about government corruption? How could anyone in this ‘entitlement-free’ age think that spending between $400,000 and $600,000 per asylum seeker per year is a reasonable cost when the UN does it for less than $800 per year. Yes, that is the cost differential – I haven’t forgotten any zeros. The UN looks after 200,000 refugees in SE Asia for less than what it costs us to look after 4 refugees on Nauru. And who exactly is getting all of this money? It’s clearly not all being spent on accommodation or food – so whose pockets are really being lined? Why would anyone select an island in the middle of nowhere with less than 10 kms of inhabitable land and a history of unemployment at 90% as a viable solution for resettling a group of refugees? Who exactly would choose an island that even the locals have considered deserting because they are doubtful that it will be able to sustain them? What could be the justification for deciding to increase Nauru’s population by close to ten percent through the resettlement of refugees? And while the government is now looking at alternatives to move some of these refugees – how is $50 million to move four of them to Cambodia any more palatable? There are also plenty of unanswered questions around human rights abuses and the refusal of Nauru to allow any press other than a hand-picked Murdoch journalist onto the island. However since these questions are being covered extensively elsewhere, I haven’t covered them here. I find it impossible to look at the image of this tiny little rock in the middle of the Pacific ocean – so crucial to our government’s refugee policy – and not wonder if there is a single non-political reason for continuing our arrangements there. To me Nauru seems like a ridiculously expensive political solution that has seen victims of war, terrorism and persecution who, having escaped hellholes in their country of birth in order to find a safe place to put their feet, end up in a location referred to by the BBC as Australia’s Guantanamo. Instead of safety, they have ended up on an island where they sleep in moldy tents and are unable to protect themselves and their children from being sexually abused. It’s no wonder Australian officials have been able to convince Syrian refugees to return to Syria – despite the war there continuing to worsen. Further, at the end of the day it’s arguable that we aren’t doing Nauru any real favours. They clearly had more than enough of their own problems before we came along. With an economy that is probably unsustainable without the Asylum Seeker industry and with the prospect of climate change seeing many of the inhabitable parts of the island going underwater, it’s difficult to see how the island has a future. The Asylum Seeker industry – and the accompanying foreign aid – has propped Nauru up temporarily and stalled them having to face the realities of how they make a future for themselves once the Asylum Seeker Industry is gone. It doesn’t matter which way you look at it, this government’s refugee policies are an abject expensive failure. They have stayed in place and avoided scrutiny for so long by fanning the flames of bigotry which lie in many corners of Australia, by mixing up the issue of refugees with border security, by hiding behind spurious ‘saving lives’ claims and through the self-righteous (and erroneous) proclamations of having stopped people smuggling. One day history is going to look back on Australia’s current refugee policies in the clear light of day with horror, disbelief and shame.